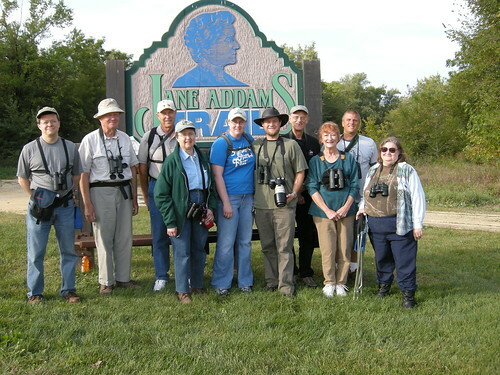 We had 11 participants for the September 19th field trip to the Jane Addams trail. Bird activity was low and didn’t really pick up until we moved on to the section of trail by Scioto Mills (where the Golden-crowned Sparrow was discovered). The highlights: small flock of Sandhill Cranes, 2 Bald Eagles, 2 Philadelphia Vireos, 1 female American Redstart, Swainson’s Thrushes, a nice-sized group of Wood Ducks, and a Yellow-bellied Sapsucker. Any Mississippi Kites seen since 9/16? The last report of a Mississippi Kite from the Bloom School area was on Wednesday, 9/16. Has anyone seen a kite, whether adult or juvenile, in that neighborhood (or nearby) since that date? If so, please post a reply by leaving a comment. I am trying to determine the last date that the kites were here. Last year, the last sighting of an adult was on 9/21 and the last sighting of the juvenile was 9/29, so, if they haven’t left yet, they are probably packing their bags. Tens of thousands of MIKI have already flown over Veracruz, Mexico on their way further south. Posted on September 23, 2009 Author Dan WilliamsCategories QuestionsLeave a comment on Any Mississippi Kites seen since 9/16? The October 10th NCIOS field trip to the International Crane Foundation is fast approaching. Please see our calendar of events for full details. This is just a reminder that reservations and money must be received by Ken Frey by Wednesday, September 30th. The cost is $7.00 for adults and $2.00 for children 18 and younger. We hope to see you out there!! Call Ken at 815-877-5028 for payment and reservations. Female kite with butterfly. Photo by Vic Berardi. Dan and Barbara Williams and I have been monitoring kites near Bloom School this year. Kites first appeared in the last half of May. There was one pair of adults, and another pair with an adult male and a subadult female. Neither pair apparently nested at the school, as they did last year. However, a juvenile bird has been flying around for the last 4 days. If you want to see any of these birds, don’t delay, as they could leave for wintering grounds in the next week or two. While you might see them from the school grounds, you are more likely to find them in the area bounded by Highcrest, Westchester, Guilford, and Stratford. Besides checking the skies frequently, you should check possible perch places, like bare tree branches, TV antennas, etc.